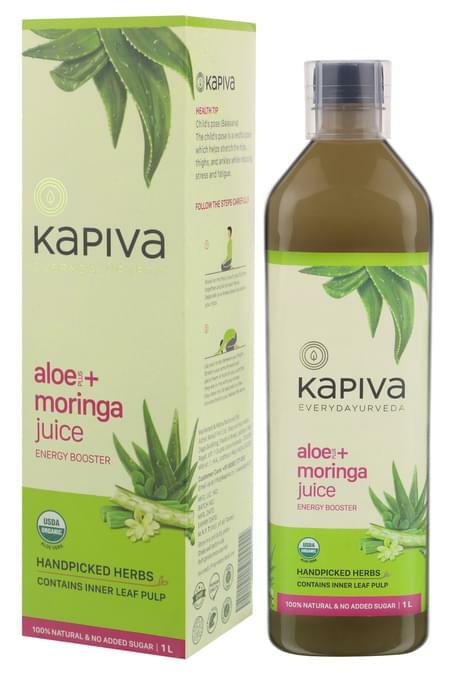 Kapiva’s Aloe Vera and Moringa Juice is made from natural ingredients to boost up your energy levels. Made from 100% organic hand-picked herbs, this juice is a great source of energy to increase your stamina. It mainly contains Aloe vera pulp and Moringa without any synthetic flavour, colour, oil, or impurities. This perfect mixture of natural elements is the right energy resource and will boost your energy. it contains no sugar or oil, hence it is a pure outcome of natural elements to offer a healthy lifestyle. Benefits of Aloe Vera and Moringa Juice: • It is full of antioxidants which are natural energy boosters. • Protects against radicals that contribute to fast ageing process. • Cleans your blood and gives a smooth and natural glow to the skin. • Adds natural cleansing to your digestive system, and maintains the desired weight. • Boosts your immune system and protects against a number of viruses. • Increases your focus and concentration level. • Gives muscle relaxation, relief from stress and anxiety. Usage: • Mix 30ml of juice in a glass of water. add honey or salt or sugar as per taste.